Heat pumps - Stroj-energijska tehnika d.o.o. Heat pumps – an excellent space and water heating solution. Heat pumps are an economical and environmentally friendly way of heating. They are easy to maintain, and offer low operating costs as well as long service life. Heat pumps do not emit any harmful substances, odours or filth. By incorporating a heat pump into Stroj heating system (or into the Stroj combination boiler), we can achieve an efficient and reliable combined heating system, which further reduces heating costs. If you are considering installing a heat pump into your heating system later on, we can pre-install a heat exchanger into your new Stroj boiler.In this way you do not need an integrated heat pump unit, which allows for a simpler manufacture, maintenance, and significantly reduces the cost of investment. It is also possible to integrate a simple and high-quality heat pump into an older operating boiler, with an easy installation procedure, and without significant costs. The boiler is installed with a heat exchanger for heat pump, which is an excellent addition to the existing heating system. In practice, this means that the heat pump’s operation is aided by the sun (pre-heating), oil/gas, pellets, or wood (additional heating). Thus, the heating system is upgraded, while the cost of investment is significantly smaller. To retain all functionality of the heat exchanger, it has to be installed in the exact designated space. Therefore, we recommend that you leave this installation to us. The installation is simple and does not require any construction or earthworks, which reduces investment costs. 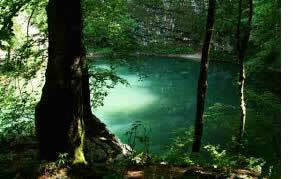 Most commonly used type of heat pump is air-water. By means of an external module, the energy is retrieved directly from the ambient air. This is an economical support for STROJ boilers, thus, heating with a heat pump is an extraordinary solution to reduce energy consumption and CO2 emissions. The heat pump is a technologically advanced system. The greater part of the heat is produced from renewable energy sources. Its main part is a thermodynamic machine, which receives thermal energy from the environment (air, water or ground), and, using a compressor, increases it to a higher temperature, for the purpose of heating. The heat pump needs electricity and ambient air energy. The ratio of input power vs. the consumed renewable energy from the environment (air) is 1:5. This figure indicates that you obtain 40–80% of energy from a renewable source. 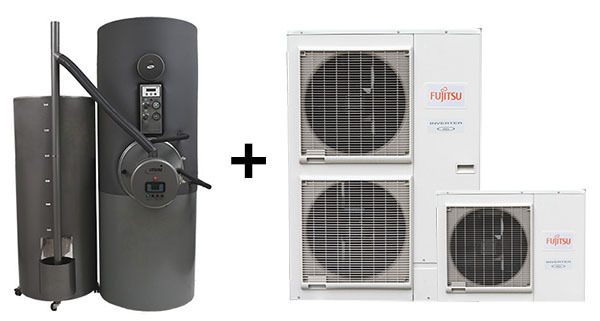 Our offer includes heat pumps by a recognised manufacturer Fujitsu. Their Japanese scientist in Kawasaki have developed a technology based on many years of development and research of the unlimited aero-thermal heat source. They offer superior comfort and a perfectly shaped and simple control module, through which you can smoothly and easily adjust the temperature of your home. The biggest concern in using heat pumps air-water is noise. The Fujitsu heat pumps are extremely quiet, with a highly efficient fan that provides more airflow at lower noise levels. They are characterised by low operating costs, clean and healthy system that does not emit any harmful substances or dirt, easy maintenance and a long service life. The three phase heat pumps AIR-WATER FUJITSU WATERSTAGE HIGH POWER INVERTER with a heating power of 11, 14 and 16 kW are ahead of the competition. Improved “liquid injection” technology (liquid Freon injection into the compressor): the engineers have developed a linear control of injecting liquid into the compressor, and have thus achieved excellent operation of heat pumps at low temperatures. The nominal heating capacity is maintained up to the outdoor temperature of –7 °C, and only begins to fall slightly at lower temperatures. Fujitsu heat pumps have a high coefficient of performance (COP), even up to 4.52. COP is an indicator of the heat pump efficiency; it defines the difference between the amount of heat generated by the heat pump and the energy consumed by the equipment for its operation. The higher COP, the higher the efficiency of the heat pump. COP of 4 means that the heat pump produces four times as much energy as it needs for its operation. COP 4.25 (model WOYK-112LCT) provides for an extremely low electricity consumption. With the outdoor temperature of –20 °C, the heat pump can heat water up to +60 °C, without the use of auxiliary heaters. 11 kW model WOYK-112LCT heats water up to 35 °C (at an outdoor temperature of –20 °C), providing further 9.89 kW of heating power without the use of auxiliary heaters, while COP is still higher than 2. For more details, see our catalogue. Most heat pumps air-water loses a part of its efficiency and heating capacity when the outdoor air temperature falls below 5 °C. Therefore, it is advisable to have an additional heat source available, which will complements the heat pump in the event of extremely low temperatures (cold winters), or in the case that the heat pump cannot produce sufficient amounts of heat.